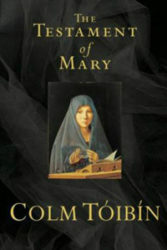 While The Testament of Mary is distinctive from the six prior novels Tóibín has written, it remains classically Tóibín. Quietly but intensely drawn, raw and yet understated at once, the text reflects Tóibín’s canon-wide penchant for using spare but beautiful, powerful prose. It equally displays his gift for questioning and challenging dominant, received narratives, and his refusal to value them more than the personal experiences and testimonies of an individual, private life. Those looking to this novel for faithful adherence to the Biblical narrative will be surprised. Mary’s rendition of events is pointedly non-canonical. Mary portrays the apostles as arrogant and manipulative, with ‘a brutality boiling in their blood’ and she identifies them contemptuously as ‘fools, twitchers, malcontents, [and] stammerers’ (3, 66). The miracle of Lazarus is more tragic than inspiring: noting, perhaps ironically, that Lazarus ‘would need another realm in which to flourish’, Mary implies that the reversal of his death is more an unnatural aberration than a blessing, since ‘no one should tamper with the fullness that is death’ (29, 31). Indeed, the miracles and Jesus’ divinity are generally in doubt: Mary uncertainly notes that witnesses were not actually there to observe Lazarus’ resurrection, and she presents her own shared observation of Jesus back to life as ‘a dream’ (39, 89-91). At the same time, just as he rejects the idealization of motherhood in his first novel, The South, Tóibín does not follow the common representation of Mary crafted in the selfless, saintly, humble maternal mold. Rather, Tóibín’s Mary is thoroughly human, with all the foibles and flaws that connotes. She speaks repeatedly of her distaste for Jesus’ earliest followers, whom she distrusts as a bad influence and calls ‘a group of misfits’ (9). She betrays irritation and even a capacity for violence, claiming that listening to Jesus speak to his apostles ‘set [her] teeth on edge’ and threatening to stab an apostle who seeks to move a chair she has reserved for Joseph in memoriam (16, 22). This Mary is also prone to anxiety and weakness: she experiences denial in the face of the horror awaiting her son (57), marvels at and dreads the inexplicable cruelty of men (69), and rues her capitulation in the face of such violence and evil, fearing that she abandoned her son: ‘And maybe I should have moved towards him then, no matter what the consequences would have been. It would not have mattered, but at least I would not have to go over and over it now, wondering… how I could have watched and remained silent. But that is what I did’ (77). Far from a saintly, pure embodiment of selfless motherhood, Tóibín’s Mary is a fully-conceived woman with her own capacity to experience grief, guilt, irritation, terror, and pain. It is, however, in Mary’s very humanity that the question of the ‘truth’ of Jesus’ narrative becomes largely ancillary to the focus of the novel. The text is not a testament in the sense of confirmation of an authorized or institutionalized account, but rather an illustration of the ways in which dominant narratives seek to control and potentially elide the emotional, lived experiences of individuals in favor of a larger, unitary claim. Mary repeatedly notes the apostles’ attempts to craft and dictate her story, observing that one apostle would ‘scowl impatiently when the story [she tells] him does not stretch to whatever limits he has ordained’ (5). (This conflict also invokes gendered divisions throughout the novel, as Mary repeatedly indicts men as invariably provoking violence, and as her recourse to Artemis – goddess of the hunt, but also of childbirth and virginity, whose famous Temple is in Ephesus – offers a woman-centered alternative to the apostles’ controlling narrative). Mary’s refusal – or inability – to deny the messy complexity and horror of her experiences also contrasts with the apostles’ determination to sanitize and package their common experience: ‘[T]hey want my description of these hours to be simple, they want to know what words I heard, they want to know about my grief only if it comes as the word “grief”, or the word “sorrow”. Even though one of them witnessed what I witnessed, he does not want it registered as confusion…’ (80). Unlike the apostles, however, Mary claims, ‘I cannot say more than I can say’, and she defiantly refuses to ‘say anything that is not true’ (4-5). Mary’s testament, then, is an act of defiance as much as of self-expression, as she refuses to surrender her narration or her understanding of her own reality. What is true for Mary is not only the fear and horror she endures and her rejection of the apostles’ version of events: at the core, Tóibín’s Mary is a mother who cannot reconcile herself to the very human torture, suffering, and death of her son. Like her protective suspicion of Jesus’ followers, Mary’s response to Jesus’ increasingly proselytizing role has far less to do with any question of divinity than with her sense of alienation: ‘He was so far from the child I remembered or the young boy who seemed happiest in the morning’ (49). In a touching and creative moment, Tóibín recasts the miracle of water into wine into a surreptitious attempt by Mary to convince her endangered son to save himself: she attends to ‘see if [she] could get [her] son home,’ even though she ‘disliked weddings’ (27). Most tellingly, as the story of Jesus’ crucifixion unravels, Mary sees not a dying savior or a criminal, but the vulnerable child she carried in her body: ‘He was the boy I had given birth to and he was more defenseless now than he had been then’ (74). Told of the arising narrative that Jesus’ death would redeem the world, then, Mary responds as any mother might, rejecting both the sanitized narrative and the personal cost to her family: ‘I can tell you now, when you say that he redeemed the world, I will say that it was not worth it. It was not worth it’ (102). Ultimately, The Testament of Mary is not only a moving exploration of one woman’s pain and fierce maternal love. By humanizing Mary and privileging motherhood over divinity, the novel represents the difficulty of defending the complexity and integrity of a personal or individual narrative from the dominant, sanitized histories that threaten to subsume them. Tóibín once again hauntingly reminds us that truth is always at least partly subjective, and that individual truths merit the same respect and dignity as their authorized counterparts.